Whether you need professional cleaning of the mattresses in your home, hotel, rented or commercial property, you can completely rely on our staff to provide it. They have the skills, equipment of machines and products for sanitising which are necessary to do the work properly and ensure the desired results. We are a fast growing agency, based in Dulwich SE21, that offers excellent mattress cleaning. Our team of cleaners are trained in the latest and most effective techniques for sanitising all kinds of mattresses. Open coil, pocket spring, memory foam are only some of the mattress types they can clean. Use our reliable mattress cleaning services whenever you need them for your property, located in Dulwich or anywhere nearby. Our staff of cleaners are experienced and skilled enough to take care of every mattress, regardless of its condition and type. They will come for inspecting the mattress and applying the necessary procedures to sanitise it in depth. We offer effective and complete stain and odour removal, cleaning of mould, dust mites and other allergens. The dry and steam cleaning machines which our employees work with ensure perfectly sanitised and dry mattresses. After all cleaning procedures are completed, our staff deodorise the mattresses and they are as clean as new. Take advantage of our professional mattress cleaning services which are at your disposal within SE21 Dulwich every day of the week. All you have to do is use our call centre or booking from to reserve a free inspection of your beds. Our staff will prepare and send you a no-obligation quotation which will be in accordance with your needs. Keeping your beds and mattresses in clean and hygienic condition is vital for your health. 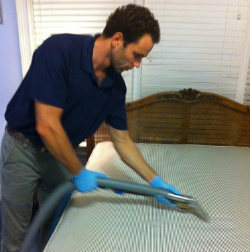 Let us provide the professional mattress cleaning you need.